Wanderlei Silva is an anomaly in professional sports, a bona fide star who isn't one of his organization's top competitors. It's Kobe Bryant who is the Lakers' biggest star, not Antawn Jamison. It's Sidney Crosby who is the Pittsburgh Penguins' biggest attraction, not Craig Adams. And it's Tom Brady who is the fan favorite for the New England Patriots, not Danny Woodhead. Silva occupies a special place in the hearts of MMA fans and, even though it's been more than six years since he's won back-to-back fights, remains one of the UFC's biggest stars. He returns to Japan on Saturday, the place where he blossomed into a superstar while in the PRIDE Fighting Championships, to fight Brian Stann in a middleweight bout that will be the main event of UFC on Fuel 8 at the Saitama Super Arena in Saitama. Silva is just 5-6 in his UFC career and has never won consecutive UFC bouts. The last time he won two in a row anywhere was in 2005 and 2006, when he scored wins over Ricardo Arona and Kazuyuki Fujita in PRIDE matches. No matter, though. When Silva is introduced by Bruce Buffer before the start of Saturday's bout with Stann, he'll be greeted as he is just about everywhere he goes: as a conquering hero. "There aren't many moments in sports like it, being in the main event [of a fight card] and having the crowd cheering so much," Silva said. At a time when UFC officials are looking to dramatically shed their roster, Silva continues to be one of its top attractions despite a record that, in other circumstances, would put him squarely on the chopping block. With the new fighters the UFC has signed and the absorption of nearly 60 fighters from Strikeforce, the UFC has about 475 fighters contracted when it needs no more than about 350-375. As a result, there is a purge underway that has led to the release of some big names, none more notable than welterweight Jon Fitch. Silva, though, said he doesn't give that a second thought. And though he's just 3-7 in his last 10 outings, Silva won't fight any differently against Stann than he did in any of his previous 48 bouts. 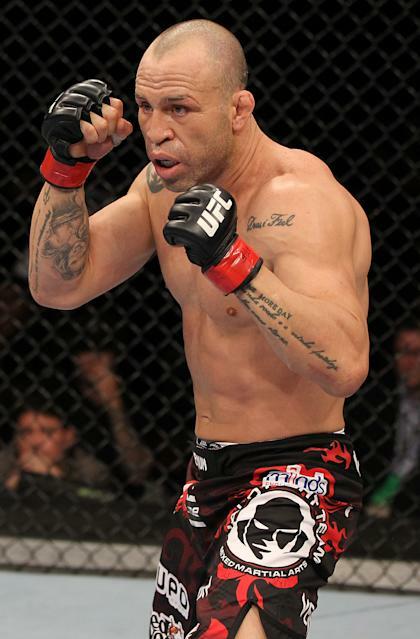 It's because if ever there were a heart-and-soul fighter, it is Wanderlei Cesar da Silva. He's the infielder who dives into the stands chasing a foul pop, the forward who will jump in front of a 100 mph slap shot to prevent a goal. He's all out at all times, an attitude he constantly expresses to his Las Vegas-based fight team. "You can't fight like a machine, like you are worried about what the promoter is going to think," Silva said. "[UFC president] Dana [White] isn't really the one who is going to [cut] you. You cut yourself. I talk to my guys and I tell them, 'You have to fight in a way that you don't give the promoter a choice but to bring you back.' If you go out and make a show and put your heart on the line every time, the people will respond to that and the promoter won't be able to say anything." Silva is so beloved by the fan base that many are fearful for his safety. He's 34-12-1 with a no-contest, and has scored 24 wins by knockout. More significantly to his fans, though, is that he's been knocked out six times himself, often violently. But he's coming off a Fight of the Night loss to Rich Franklin at UFC 147 in which he didn't sustain much damage. The fight before that was a one-sided victory over Cung Le at UFC 139 that was a co-Fight of the Night along with the epic Dan Henderson-Mauricio "Shogun" Rua bout. Silva doesn't know Stann that well personally, but he's eager to face him on Saturday because he believes Stann is the same heart-and-soul fighter he is. "He is a great person and did many good things in the military," Silva said of Stann. "His style is great, too. He likes to go to war. This is a match the fans will love, trust me." When Wanderlei Silva is involved, win or lose, that's almost always true. • Can NFL teams ask Manti Te'o if he's gay?